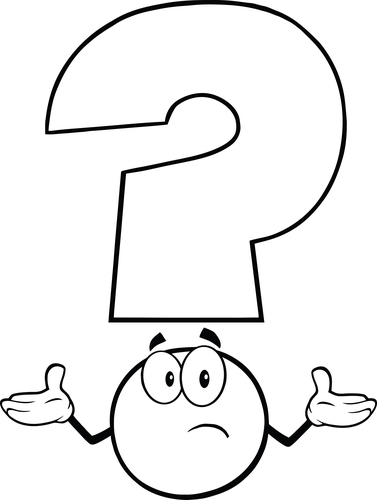 Do Central Banks suffer from “Infusion Confusion”? When it comes to currencies and inflation, my go to guru is Everbank’s Chuck Butler. Chuck writes the Daily Pfennig which is a must read. He keeps us up to date on the currency markets and his predictions are almost always spot on – generally well ahead of everyone else. Chuck also has a terrific sense of humor. He goes in regularly for “infusion” chemotherapy cancer treatment. He jokes about the next day, calling the side effects “infusion confusion”. I want to talk to Chuck about the world Central Bankers. Bloomberg recently reported, “Abe’s Fiscal Plan Follows a Long Road of Packages That Failed” – outlining Prime Minister Shinzo Abe’s “bold” plan to revive the economy with a $273 billion dollar package. It’s the 26th dose of fiscal stimulus since the country’s epic markets crash in 1990. Since 1993 their central bank has attempted to revive their economy by infusing cash into the system. It’s been a colossal failure. Continuing with the same behavior and expecting a different result is not “infusion confusion”, it’s insanity! I don’t get it! It’s time to call Chuck. DENNIS: Chuck, on behalf of our readers, thank you for your time. Let’s get right to it. Can you explain why Japan is flooding their banking system with money? What are they trying to accomplish? CHUCK: Thanks for this opportunity. I’ll answer your questions with what I call, “Chuck speak”. Basically, money supply is equal to inflation – but that’s “old school”! In the “old days” if a Central Bank grew their money supply by 6%, you could figure that the rate of inflation would be around 6%. Central Banks today, still think that if they flood the economy with money, that they’ll achieve their desired inflation. Why do they need inflation? The G-20 governments have all run up unsustainable debt. Future tax receipts, even with massive tax increases, will not be able to keep up with the payments on the bonds that were issued to finance their debt. If they try massive taxation, invest in tar and feather businesses. The Central Banks feel inflation is a way to deal with the debt. Inflation will allow $20 bills to be worth $5, and thus the debt becomes more bearable. That’s what they want to accomplish, without the tar and feathers. Why it no longer generates the desired inflation is a different discussion. I’m loaded for bear on that one when you are ready! DENNIS: Recently the BBC reported, “(A) rate cut was a “foregone conclusion” as economy slows sharply.” Why do the governments and central banks increase spending and cut rates, almost automatically? There is no evidence that those policies work. CHUCK: What has happened to prudent Central Banks? These were the Central Banks with a primary mandate to provide price stability. That means they would keep inflation in check, and therefore maintain the respective currency’s value. You would never see Prudent Central Banks debase their currency with rate cuts like we’ve seen in the past 9 years. But I digress – the increase in spending is suicidal to every country that is undergoing such measures. They know they have no way to pay for this increase in spending. They hope that by cutting interest rates it will spur the economy, to generate extra tax receipts to pay their debts. But something funny (not funny ha, ha) happened on the way to the forum. The Central Banks have cut rates too low to make a difference. The economic theory didn’t work the way they thought it would. There’s no economic upturn and increased tax receipts. Instead these infusions are stifling growth. I loved your article calling this mess a ginormous fur ball. That sums it up well. DENNIS: After the July G-20 meeting, it became clear the major central banks of this world are working in unison. 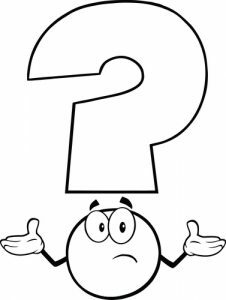 If devaluing the currency makes exports easier and helps their economy grow, how does anything improve if they are all devaluing and maintaining parity? CHUCK: Dennis, I do believe that a more important G-20 meeting is coming in September, when it will be held in China… I feel China’s strategy will be to push the U.S. into a corner, and then not getting what they want, remove the dollar as the main currency that the renminbi is pegged to. To answer your question, the countries will achieve nothing from these currency wars. Like conventional warfare, no one wins. Sooner or later, probably later, these currency wars will explode with chaos, a fur ball of ginormous magnitude. The countries with large gold holdings will come out the winners. Russia and China have been significantly increasing their gold reserves; probably in anticipation of that day coming. Of course that’s my opinion and I could be wrong. “Can you get your arms around that scenario for the U.S.? Helicopter money and negative rates? Well, I can, because I’ve been warning you for so long now about what the Deficit Spending and debt accumulation was going to do to us eventually. And Helicopter money will just increase the debt by whatever amount the White House and Congress agree on, but you can bet your sweet Bippie that it won’t be a “small amount”. A recent article shows negative rates are backfiring. Chuck, it’s scary. If that comes to pass, what should our readers expect? CHUCK: Dennis, should that scenario happen, we would see the dollar lose a lot of value, and perhaps very quickly. Most people never think about the value of the dollar, for they have dollars in their pockets, and they think they buy the same stuff as before. But they would be wrong. When the value of the dollar decreases, their purchasing power decreases. Things we import will cost more, period. It is very harmful to those on fixed incomes and baby boomers looking to retire. The purchasing power of their life savings can drop dramatically. The article about the negative rates backfiring indicates people are hoarding and buying gold to protect their wealth. They are scared and who can blame them? DENNIS: I recently compared the American Dream to the Jenga game. With each passing day, another Jenga block is being removed from what we thought once was a strong foundation. If the world governments continue to infuse their banking system with borrowed money that taxpayers cannot possibly pay back, do we get to the point where the cure is worse than the disease? Sounds to me like “Infusion Confusion” to the 100th power. CHUCK: Yes, and I love your adaptation to my calling the day after infusions to “infusion confusion”. My boss, and longtime friend, Frank Trotter coined that phrase. And you are correct. Taxpayers will not be able to keep up with the interest payments on the bonds that were sold to finance the debt. You can’t cure a debt problem with more debt. The banks infusion chemo cocktail has turned them into addicts. They are trying to forestall “judgment day” by keeping interest rates artificially low. The US has almost $20 trillion in debt. A 1% increase in rates increases the country’s deficit by $200 billion. Back in the Quantitative Easing (QE) days there was one year the Federal Reserve bought almost 70% of the bonds in the Treasury Auctions, rather than let interest rates rise to a free market level. When no one wants to buy more US debt, that’s when a Minsky Moment will be on us in a heartbeat… And we all know what happens after the Minsky Moment, right? Can you say stock market bubble popping? Can you say mortgage sector bubble popping? Well, when the Government bonds bubble pops, it will be ginormous, making those previous bubble poppings look tame! DENNIS: Based on your history, I’m not betting against your opinion. We both want to be wrong, but the risk is much too high to ignore it. Being a decade older than you are, thanks again for taking the time to share your thoughts – young man! CHUCK: (Chuckles) My pleasure Dennis. Joe Sixpack is smart enough to know only stupid politicians feel you can spend money you don’t have without bad consequences. It’s no wonder the political class is held in such low regard. Unlike the banks, Chuck’s “infusion confusion” is over in a day. I too fear the Minsky moment. Those who are prepared will fare much better than most as opportunities will abound. Driving across America can be fun when you don’t have a deadline to meet. When Jo’s drives, I crank back my seat, grab a pillow, and click the noise cancellation button on my headphones. Sometimes I’m napping, but many times I’m just enjoying the silence lost in my own thoughts. As the last of the green Midwest farms faded in the distance, I though back to my boyhood days on my grandparent’s farm. There was no such thing as retirement. On a dairy farm everyone worked every day. In the late summer, before breakfast I would go to the garden with bushel baskets and pick the daily harvest of fruits and vegetables. After breakfast my great grandmother (born 1860) would take her walker and head for the front porch swing. I would carry pots of beans and sit them next to her. 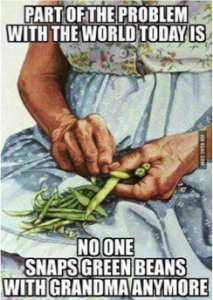 After my grandmother (born 1890) and I finished dishes we would sit on the rocking chairs and spend countless hours snapping beans or shucking lima beans that would be canned for food over the winter. The days were filled with snap-snap-snap and constant discussion. I heard first hand accounts of history from right after the civil war through the Great Depression and the ending of WWII. I loved the tales about going from horse and buggy days to the automobile. My great-grandmother never called them cars; they were “machines” to her. Good friend Jim M. shared this Facebook wisdom. A lot education and basic values were passed from generation to generation on front porches all over America. Today’s young ones can’t seem to sit still. Without their I-pods they complain about boredom. No one really sits and talks with their grandparents like they used to anymore. Young people would look at the graphic and not understand the meaning. While I am a great believer in progress, sometimes we lose a lot along the way. Nothing makes me feel so old as having to scroll down a few pages to find the year I was born. The sad part about getting old is you stay young on the inside; but nobody can tell anymore. The trend you and Chuck are discribing is unmistacable matching a long predicted movement as outlined by Cleon Skousen in his epic book ” The naked Capitalist” ,a commentary on the work of Professor Quigly “Tragedy and Hope” . As an insider he describes himself a spokesman of the ruling class, and the futile attempts of the masses to throw of the burden put on them by the elite. This book was written many years ago, but is as up to date as your newspaper. There are so many pundits calling for some type of collapse it is amazing. One side of me remembers the days as a kid when we were taught to crawl under our desks at school in case of a nuclear attack – which never happened. On the other hand, baby boomers are not kids anymore. We are at the point in life where preservation of capital is paramount. The fallout from an economic catastrophe, should it occur, would be terrible. I’m finally resigned to the idea that prudent investors must prepare for the worst and hope for the best. Should the “Minsky Moment” happen, we will be much better off than those who ignored any possible concerns. In essence, better safe than sorry.